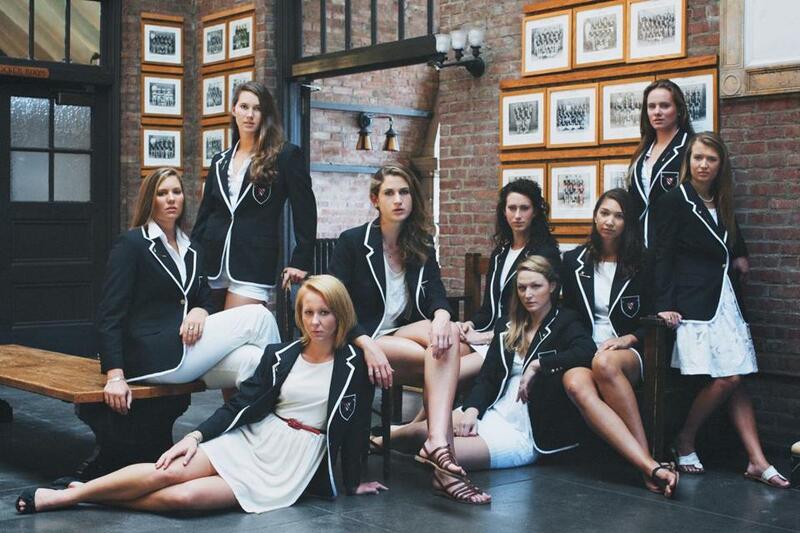 The Radcliffe College team in their Henley blazers. American rowing champion Jack Carlson’s fascination with rowing-club blazers started 10 years ago when he and his crewmates got measured for theirs at the Andover Shop in Harvard Square. During a regatta on the Thames, his crew was knocked out of competition in the first round so he had plenty of time to feast his eyes on the club blazers all around him. Now he’s a doctoral student at Oxford University, regarded as the spiritual home of the boating jacket. Early blazers were made of flannel and intended to keep rowers warm. They evolved into colorful, sometimes garish, items intended to help people on the riverbank identify teams during races. Today, the rowing blazer is a fashion statement and status symbol, mainly worn on solid ground. Carlson’s new book “Rowing Blazers” (Vendome) features photographs of Olympic rowers and crews at boathouses, prep schools, and college campuses around the world. Most of the images were taken by fashion photographer F.E. Castleberry, founder of the “Unabashedly Prep” blog. British blazers dominate the book, but New England jackets make a respectable showing. According to Carlson, it wasn’t until the Beacon Cup Regatta in Boston in 1858 that Harvard adopted crimson as its color. The Harvard oarsmen, looking for a way to stand out from the other crews, wore red silk handkerchiefs as bandannas. Four Stories will launch its fall season with “Girls Night Out,” featuring debut novelists Robin Black and Julia Fierro, acclaimed novelist Jennifer Haigh, and Joanna Rakoff, author of the memoir “My Salinger Year’’ (Knopf). The fun begins at 6:30 p.m. Sept. 15 at Middlesex Lounge, 315 Massachusetts Ave., Cambridge. Michelle Seaton, who has written fiction, nonfiction, and is a guiding light of Grub Street’s Memoir Project, will host the evening. The Cambridge Historical Society will celebrate the city’s literary heritage on Sept. 20. From noon to 3 p.m., the public is invited to drop by the garden at the Longfellow House-Washington’s Headquarters National Historic Site to chat with performers portraying 19th-century writers, such as Margaret Fuller, Washington Irving, Harriet Beecher Stowe, Henry David Thoreau, Julia Ward Howe, and Nathaniel Hawthorne. Howe and Hawthorne were frequent visitors during the 45 years poet Henry Wadsworth Longfellow lived in the house. In addition to engaging in conversation, performers will read selections from the writers’ works. Tours of the house will be provided on the hour from 10 a.m. to 4 p.m.
From 5:30 to 7 p.m. historian Rob Velella will lead a tour of the cemetery at 76 Coolidge Ave., highlighting the graves of these and other literary figures.